Volkano Lifecam Plus series Silver action camera Copyright © 2019 ComXpert International CC - COPYING IS ONLY ALLOWED FOR THE PURPOSE OF SENDING US ENQUIRIES. E&OE. Explore your world and record every minute of it with the Lifecam Plus Series Action Camera. From skydiving to snorkeling, surfing or more, the Lifecam Plus can be attached to almost anything, is water resistant up to 30m, includes an accessory kit and films in 720p. © 2019 Respective owners and brand holders. This table has been carefully researched and generated by ComXpert International CC (//www.comx-computers.co.za), however, errors and omissions may occur. Only references to South Africa apply. All products are sourced in South Africa from the official suppliers and the warranty is that of the local supplier. E&OE. This table and our site's content may be used on condition that this notice and link remains intact and unaltered. , ©2019 ComXpert International CC Copyright © 2019 ComXpert International CC - COPYING IS ONLY ALLOWED FOR THE PURPOSE OF SENDING US ENQUIRIES. E&OE. The best price and guaranteed service and backup from official computer suppliers in South Africa for the VK10006SL Volkano Lifecam Plus series Silver action camera. 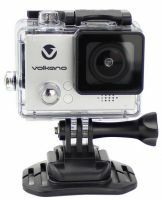 The Volkano VK10006SL Volkano Lifecam Plus series Silver action camera is available for R845. The product is sold by ComX Computers as new. Prices are valid today 2019-04-22 (before 2019-04-23 , by quote, while stocks last). The product is expected to be in stock, although this is not guaranteed. Find related VK10006SL Volkano Lifecam Plus series Silver action camera products in our Action Cam / Body Cam Category for even more options. Read reviews and find out about VK10006SL Volkano Lifecam Plus series Silver action camera. Discounts, specials and cheap prices only at ComX Computers.